This set contains all new race spec aluminium blots to replace the standard Aprilia bolts when rebuilding or restoring your motorcycle. Where applicable the sets contain all the engine casing bolts, including aluminium bolts for the clutch cover, water pump housing, alternator cover and sprocket covers. The race spec engine casing bolt sets are designed to be easy to use and makes replacing the bolts on your Aprilia simple. The race spec bolts are lightened even futhure than other bolts, and are pre drilled with holes to allow fastening onto the motorcycle with lock wire. Each bolt is matched exactly to the length and thread allowing you to remove and replace one bolt at a time. All the bolts in the aluminium engine casing set are manufactured from high grade 7057 aluminium which is normally 60% lighter than the original bolts found in most motorcycles. As with all the aluminium Pro Bolt items we stock, each set is available in a variety of colours when can be selected when purchasing. 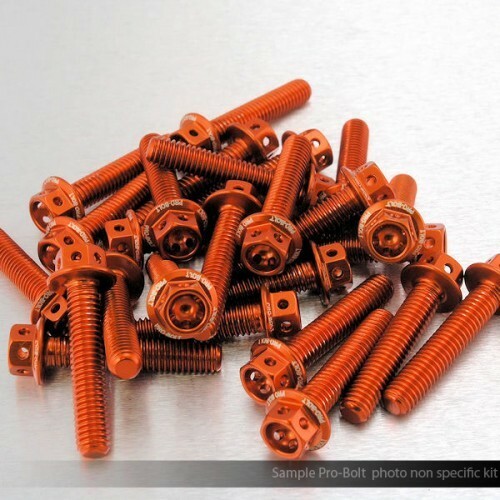 We list engine casing bolt sets for the following popular Aprilia motorcycles. If your motorcycle is not listed, contact us as we will still be able to provide you with a set of bolts for your motorcycle. Additional to the bolts in this set, you will also receive matching allen keys, pro-lube and a handy guide explaining the process and torque settings that are required. If you would like any more information or help with replacing the engine casing bolts on your motorcycle, please contact us.